Brian Francis Gibson was born on 4 November 1936 at Ascot Vale, Melbourne, the eldest son of ten children of Kingsley Melbourne Gibson and his wife Agnes, née O'Donnell. He received his secondary education at St Patrick's College, Ballarat. Kingsley Gibson worked for the Forests Commission Victoria and Brian followed his father into forestry, gaining a forestry scholarship to the University of Melbourne where he obtained two degrees: a Bachelor of Science in Forestry and a Bachelor of Arts. On 12 December 1959 he married Pauline Veronica James; they had two sons and a daughter. Gibson worked with the Forests Commission Victoria from 1957 to 1972. In 1972, although he was recruited by the Australian Newsprint Mills Ltd (ANM) at Boyer, in the Derwent Valley, southern Tasmania, he did not take up the position immediately. Rather, motivated by his concern for economic development and social justice, he fulfilled a personal commitment to work for the United Nations Food and Agriculture Organisation on a forestry project in Jamaica. He then went to the Harvard Business School in Switzerland to study management. After his return to Tasmania, in 1980 Gibson took on the role of managing director of ANM, where he stayed until 1989. As president of the National Association of Forest Industries Ltd (1987–91) he was prominent in the debates in Tasmania over the environmental effects of wood chipping and in 1988 was appointed a Member of the Order of Australia for his service to the forestry industry. On 8 June 1989 Gibson's appointment as chairman of the Tasmanian Hydro-Electric Commission (HEC) was announced by the Liberal premier, Robin Gray. His managerial experience fitted in with the commercialisation of the HEC. However, the circumstances of Gibson's appointment were controversial as neither of the major parties had achieved a majority in the May 1989 Tasmanian state election and Gray's administration was seen as being in caretaker mode until Parliament resumed. When the new Parliament first met on 28 June 1989, the Gray Government fell and was succeeded by Michael Field's Labor Government, which came to power with the support of the Tasmanian Greens. It was considered newsworthy that Gibson, who took up his new role on 1 July, had 'a reputation for being strongly antigreenie'; however, he remained in the role for the next four years. During this time he was also director of several companies, and served as a councillor of the Australian Institute of Company Directors (1990–92) and as a member of the Council of the University of Tasmania (1983–93). Gibson, who had joined the Liberal Party in 1981, was elected to the Senate at the 1993 election from second place on the Liberal Party's Tasmanian ticket. He was re-elected in 1998. Aged fifty-six when he entered the Senate, he brought a good deal of corporate experience to Parliament and he went on to use this experience to apply corporate practices and responsible fiscal management principles to his parliamentary work. I wish to influence all the so-called micro-economic reform issues which affect business and hence investment ... I therefore hope to get on top of the money flows for the federal government and also the financial relationship between it and the states. I think this is very important for all the states, particularly for smaller states such as Tasmania. Gibson also voiced his concern that Australia's productivity had failed to keep up with that of the rest of the world and therefore the country was not internationally competitive. He felt that, as a result of the government pandering to various interest groups, unnecessary restrictions had been placed on the economy, contributing to poor business growth. Furthermore, he felt that the 1992 Mabo High Court decision created 'uncertainty over property rights' which had 'deleteriously affected' the investment climate in Australia. Ten months into his term, in May 1994 Gibson became Parliamentary Secretary to the Deputy Leader of the Opposition in the Senate, Richard Alston (Vic. ), and, from December 1994, he was one of two parliamentary secretaries to the Deputy Leader of the Opposition and shadow Treasurer, Peter Costello, MHR. In May 1995 Gibson made a detailed submission to Costello, in which he advocated three fundamental reforms to budget processes: the application of an accrual accounting method to Commonwealth budgets; the appointment of a national commission of audit to report on Commonwealth finances and to lay out mid-term economic priorities; and the introduction of a charter of budget honesty to ensure that 'governments can be held properly to account for their fiscal and economic policies'. Gibson had developed his ideas on accrual accounting through his work on the Public Accounts Committee and as a member of the Select Committee on Functions, Powers and Operation of the Australian Loan Council; the method was already being used in the private sector. Gibson proposed that full revenues and expenses of government departments should be recorded for the period in which they occurred, irrespective of when cash was paid or received, and capital transactions should be segregated from operating expenses. He stated that accrual accounting was 'a commonsense approach' and argued that its adoption in Commonwealth budgets would enable taxpayers to see the true cost of running the country and would allow for a proper valuation of Commonwealth assets and liabilities. Five years later he reminded the Senate that Australia was 'the third country in the world to adopt full accrual accounting, after New Zealand and Iceland. We are certainly in the forefront of full reporting and full accountability to the parliament'. Gibson's legislative work to bring about a national commission of audit, and related measures to strengthen the powers of the Auditor-General, began while he was in Opposition, when, in 1994, the Keating Government introduced the Financial Management and Accountability Bill and the Auditor-General Bill amongst other legislation. During the committee stage of the bills, Gibson, the chief negotiator for the Coalition, played a key part in initiating and supporting successful amendments that were directed towards giving the Auditor-General greater power and independence, and giving Parliament a broader role in the appointment of the office holder. At the time Senator Cheryl Kernot, then Leader of the Australian Democrats, praised Gibson, for his commitment to achieving 'historic accountability reforms'. Although the bills were never enacted, the amended versions provided the template for the Howard Government's Financial Management and Accountability Act 1997 and the Auditor-General Act 1997. In March 1996, following an election campaign plagued by accusations that the incumbent government was not being honest about the state of the national accounts, a National Commission of Audit was established by the newly elected Coalition Government. The commission made a number of recommendations on the role of government but also recommended that the Commonwealth adopt an improved accounting framework and a charter of budget honesty. When Gibson first proposed a charter of budget honesty he based his ideas on fiscal responsibility legislation that had been introduced in New Zealand in 1994. Gibson's charter included a requirement that the government publish budget updates, signed by the Secretaries of Treasury and Finance departments, at the start of each election campaign, to better inform the electorate about the state of government accounts and the context in which election promises were costed. In 1998 such a charter was enacted as a schedule to the Charter of Budget Honesty Act 1998. In March 1996, following the Coalition electoral victory, Gibson joined John Howard's ministry as Parliamentary Secretary to Treasurer Costello. Gibson's main portfolio responsibilities were in corporate law and administration, including corporate law simplification and reform. Gibson began to implement processes and procedures that he had urged while in Opposition. He initiated a review of corporations law and the Australian Securities Commission (ASC), worked to improve control, performance and output of the Treasury, and orchestrated the transfer of the responsibility for the ASC from the Attorney-General's Department to the Treasury. In May 1996 Gibson addressed the 15th East Asian and Oceanian Stock Exchanges Federation General Assembly. In his address he announced his vision of corporate reform, describing the stock exchange as 'the corner stone of an efficient capital market'. Noting the rapid trend towards globalisation and internationalisation of securities markets, he argued that Australia could benefit from expanding its influence in the Asia-Pacific region. Presciently he also highlighted the extent to which technological developments had the potential to improve the efficiency of capital markets, pointing to the benefits of paperless transfers of title to securities and the role the internet could play in providing information on equal terms to all participants. Gibson's ministerial career came to an abrupt and unfortunate end after just seven months. Soon after the 1996 election Prime Minister Howard had introduced a ministerial code of conduct. To avoid the appearance of a conflict of interest, the code prohibited ministers from taking any decisions which would affect companies in which they held a pecuniary interest. In October 1996 questions were raised about whether a conflict of interest had arisen affecting both Gibson and the Assistant Treasurer, Senator Jim Short. Gibson had approved a routine recommendation from the ASC and Treasury affecting a subsidiary of Boral Ltd, while still holding shares in Boral. At the time, he believed, mistakenly, that he had already disposed of all his Boral shares. In keeping with his strength of character he resigned his post on 15 October 1996; Short had resigned a day earlier. Gibson told the Senate: 'I consider integrity to be of the utmost importance and the course of action I should follow has been quite clear. While there was no intended impropriety on my part, it is clear to me that these circumstances could be perceived to constitute a conflict of interest and my failure to act accordingly necessitates the action I have taken'. In 2008, commenting on the potential conflict of interest, Costello stated: 'It is unthinkable that any Minister would not have signed off on the application'. Howard agreed. In 2010 Howard noted his belief that Gibson and Short had 'paid a heavy price for an oversight that involved no skerrick of personal gain or malfeasance'. Gibson was never given an opportunity to return to the ministry, and supporters believed his absence weakened the government. Despite his forced demotion he maintained a strong generosity of spirit by continuing to contribute to the party and the Parliament in his areas of expertise: tax, public accounts and corporate governance. For example, he was heavily involved in the development and promotion of the Howard Government taxation reform measures, including the goods and services tax (GST) and business tax reforms such as cutting the effective rates of capital gains and company tax. He also strongly endorsed the 'fundamental' importance of the government's 1998 waterfront reform measures. In September 1997 Gibson was appointed by Howard to chair a government members' taskforce on taxation reform and to assist in the public consultation process on the new taxation system. The primary role of the task force was to summarise opinions, so although it received more than 600 submissions, it did not make any recommendations and its report was never released. Rather, the evidence was passed on to another task force of senior public servants which, in August 1998, published the document that laid out the government's plans called Tax Reform: Not a New Tax, a New Tax System. This led directly to the announcement of legislation to enact 'A New Tax System' (the ANTS package). The work of the original task force played a large part in the successful introduction of the ANTS measures on 1 July 2000, measures that Gibson described as 'probably the most important bills with regard to the structure of the economy of Australia that this parliament has seen for many a long day'. 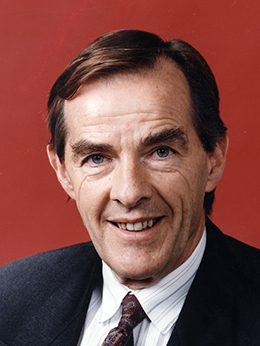 Gibson also made significant contributions through his committee work, especially as chair of the Finance and Public Administration Legislation Committee (1997–99) and the Economics Legislation Committee (1999–2002). In these capacities he chaired significant inquiries into aspects of the ANTS package, the corporatisation of Snowy Hydro and the employment conditions of public servants, among other things. Throughout his Senate career Gibson spoke passionately about micro-economic reform, pointing to the central role a comprehensive national competition policy would play in this regard. He argued that competition policy needed to encapsulate a principle of competitive neutrality—public sector enterprises should not be placed in a position of advantage over private sector rivals purely because they are government owned. Gibson was proud to have supported the Keating Government's National Competition Policy which subjected government enterprises to the provisions of the Trade Practices Act and forced them to compete in an open market, dramatically reducing consumer costs in industries such as communications and transport. He went on to describe the policy as 'the most broad-ranging program of micro-economic reform ever attempted in Australia to that time'. Gibson resigned from the Senate on 22 February 2002. After leaving the Senate he became a board member of Concept Systems (later Talent2 International), a payroll and human resource management company. He also served as the Australian Government-nominated director on the board of the Australian Stem Cell Centre and as a director of the Australian National Maritime Museum, and held executive positions in several other organisations. In his last Senate speech Gibson expressed great disappointment that the economic reforms which he had championed at the national level were not being realised in his own state, and he was troubled by the lack of investment in and the poor economic performance of Tasmania. He was critical of labour market regulations that he believed had resulted in high labour costs, which Tasmanian businesses could not afford. He was also dissatisfied with the Senate's system of proportional representation which, he believed, gave minority groups excessive influence and reduced the effectiveness and efficiency of government. He laid a great deal of the blame for the state's woes on the Greens, specifically pointing to the role they played in the closure of Tasmania's Wesley Vale Pulp Mill. Gibson was described in valedictories as a courteous, mild mannered and measured person. Democrat Senator Andrew Murray emphasised that Gibson's experience, knowledge and courtesy meant that he had a beneficial influence on senators beyond his own party. Senators made repeated references to the premature curtailment of Gibson's ministerial service 'in the prime of his political career' while serving in a portfolio 'in which he was uniquely well qualified'. Almost by way of summary, political opponent and Victorian Labor senator, Stephen Conroy said of Gibson: 'Politics is rarely fair and often cruel, and your resignation was Australia's loss'. This entry draws throughout on an interview with Brian Gibson by Paul Fenton; CPD, 18 Aug. 1993, pp. 247–51, 13 Feb. 2002, pp. 216–18; CT, 18 May 1988, p. 1, 1 June 1988, p. 21, 24 June 1989, p. 9; D. Harries, 'Energy, the Environment and the Rational, Strategic & Political Dimensions of Energy Planning', PhD, UTAS, 1996, p. 208; WA (Perth), 16 Oct. 1996, p. 1. CPD, 18 Aug. 1993, pp. 247–51. The Bulletin (Syd. ), 30 April 1996, pp. 48–49; Statement, Peter Costello, 'Charter of Budget Honesty', 20 Aug. 1996, p. 2; CPD, 20 Oct. 1994, pp. 2204–5, 6 March 1995, pp. 1422–5, 22 March 1995, pp. 1880–5, 1935–51, 27 March 1995, pp. 2181–97, 9 June 1995, pp. 1238–40, 31 Aug. 1995, pp. 738–40, 6 May 2000, pp. 13557–8; AFR (Syd. ), 22 March 1996, p. 27; Media Release, Senator Cheryl Kernot, 22 March 1995; Hawker Britton Group Pty Ltd, 'National Commission of Audit: Past and Present', Occasional Paper, Oct. 2013, p. 4. CPD, 13 Feb. 2002, pp. 142–5; Brian Gibson, 'The Government's view on the Corporations Law', transcript of speech delivered at Marriott Hotel, Syd., 14 May 1996; Press Release, Senator Brian Gibson, 27 May 1996; Transcript of speech by Brian Gibson, 'From Amsterdam to the internet: stock exchanges and the capital market', Syd., 27 May 1996. CPD, 15 Oct. 1996, pp. 4139–40; SMH, 21 June 1997, p. 1; Transcript, ABC Radio, 'PM', 15 Oct. 1996; Peter Costello, The Costello Memoirs, MUP, Carlton, Vic., 2008, p. 72; John Howard, Lazarus Rising: A Personal and Political Autobiography, HarperCollins, Syd., 2010, p. 267. CPD, 13 Feb. 2002, pp. 216–18, 227–8, 12 May 1998, pp. 2551–3, 29 Nov. 1999, pp. 10892–5, 6 Dec. 1999, pp. 11254–5; Kathryn James, The Rise of the Value-Added Tax, CUP, Cambridge, UK, 2015, p. 253; AFR (Syd. ), 5 Feb. 1997, p. 14; Richard Eccleston, The Thirty Year Problem: The Politics of Australian Tax Reform, Australian Tax Research Foundation, Research Study No. 42, 2004, pp. 133–40; Transcript, ABC TV, 'Four Corners', 18 May 1998; M. Dirkis and B. Bondfield, 'The RBT ANTS Bite, Australian Tax Forum, Vol. 19, 2004, pp. 107–58. CPD, 13 Feb. 2002, pp. 142–5; Transcript of keynote address, Brian Gibson, 'Setting the reform agenda', Melb., 9 July 1996; The Bulletin (Syd. ), 30 April 1996, pp. 48–49. CPD, 13 Feb. 2002, pp. 142–5, 216–20, 230–1, 238–9. This biography was first published in The Biographical Dictionary of the Australian Senate, Vol. 4, 1983-2002, Department of the Senate, Canberra, 2017, pp. 380-385.